He thinks that is a good thing, of course, and was making the same argument(using the same headline) in 2015. …the Danes get a lot of things right, and in so doing refute just about everything U.S. conservatives say about economics. 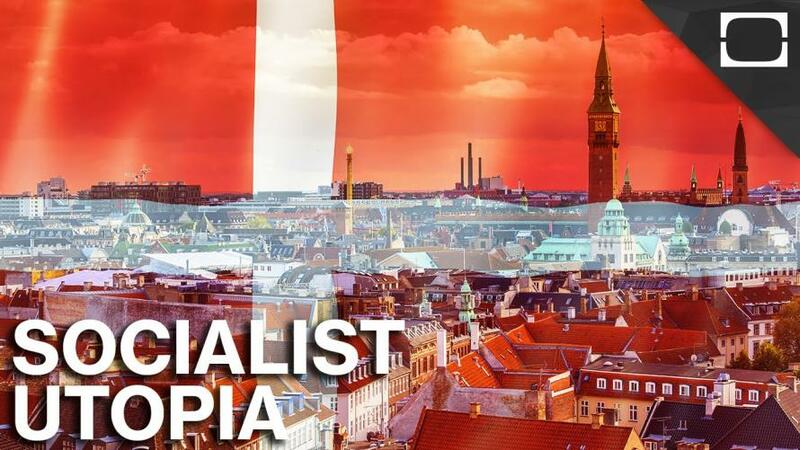 …Denmark maintains a welfare state — a set of government programs designed to provide economic security — that is beyond the wildest dreams of American liberals. …working-age families receive more than three times as much aid, as a share of G.D.P., as their U.S. counterparts. To pay for these programs, Denmark collects a lot of taxes. …Overall, Denmark’s tax take is almost half of national income, compared with 25 percent in the United States. …It’s hard to imagine a better refutation of anti-tax, anti-government economic doctrine, which insists that a system like Denmark’s would be completely unworkable. As far as I can tell, all his numbers about Denmark are accurate, but his analysis is wrong. He wants readers to believe that the lesson from Denmark is that there are no adverse economic consequences when nations impose a big welfare state and high taxes. But that’s not what Danish economic history tells us. As with other Nordic nations, Denmark became a rich nation when government was relatively smalland taxes were modest. And we know from historical data that economic performance significantly weakened after the fiscal burden of government was increased. Moreover, lawmakers are now trying to restrain government spending. A Danish economist, Otto Brøns-Petersen, has a superb description of Denmark’s economic history. 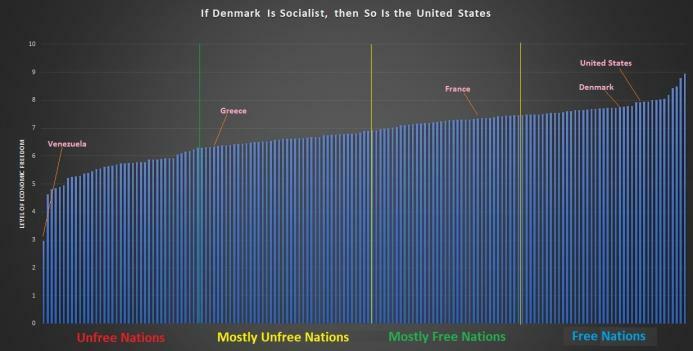 The first thing to realize is that Denmark, as are the other Nordic countries, quite free markets, apart from their welfare state transfers and high government consumption. They tend to get rather high rankings on measures of the most free economies in the World. …Protection of property rights and the integrity of the legal system are very high by international standards, as is the soundness of the monetary system… Denmark has a long tradition for free trade… Credit markets are among the less regulated internationally. During the recent financial crisis, tax payers did not have to subsidize banks, and some banks were allowed to fail. The Danish labor market is very flexible: There is no legislated minimum wage, and there are few restrictions on hiring and firing. Here’s the part that is a must-read. Denmark did not become a rich country recently. …Danish per capita GDP relative to other countries reached a maximum 40-60 years ago… Denmark caught up to and overtook “old Europe” in the fifties, while it narrowed its gap to the US and other Western offsprings until the early 1970s, when the process of catching up came to a hold. …At the time Denmark became rich relative to the rest of the World, it was not a welfare state. In fact, Denmark has historically been a low tax country by international standards. Until the 1960s, the Danish tax revenue to GDP ratio was at the same level as the US, and lower than the British. Unfortunately, policy veered in the wrong direction in the late 1960s, with very adverse consequences. The sharp divergence in the Danish tax level really occurred in the second half of the 1960s, when first a left wing coalition government and then a right wing one increased the tax to GDP ratio by some ten percentage points. …government spending was to a large extent driven by increases in tax revenue stemming from the introduction of VAT and withholding taxes on wage income. …the welfare state attracted new clients and new programs were added, the economic crisis lead to increasing unemployment… By the early 1980s the economy was in very bad shape, with high unemployment, an inflationary deflation spiral, a huge and widening government deficit. I can’t help but call you attention to Otto’s observation about how the VAT enableda far larger burden of government. 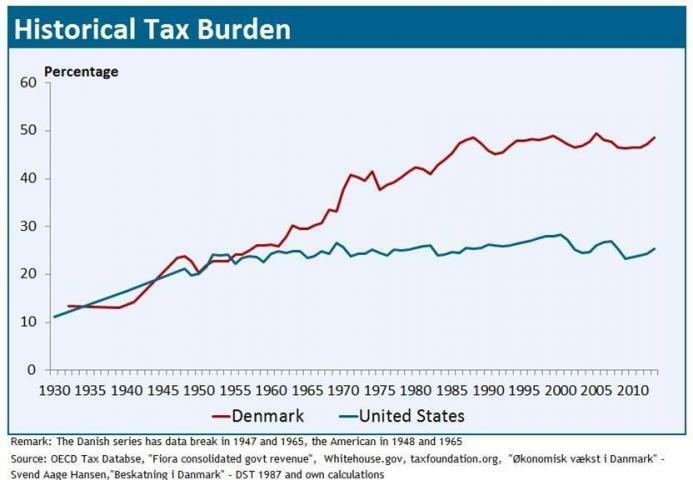 This chart shows how the tax burden in Denmark diverged from the United States. Denmark first became rich, and then introduced the programs, which make up the welfare state. The huge increase in government spending has been accompanied by deep structural problems, which has made it necessary to reform the Danish economy and welfare state ever since. It can hardly be claimed that introducing the welfare state made Denmark rich; rather it was the other way around. Denmark first became rich, and then authorities began to redistribute some of the wealth. Amen. I made the same point back in 2011. Writing for PJ Media, Tyler O’Neil reviews the good and bad in Denmark and also echoes Otto’s analysis. A deeper look at the history and current affairs of Denmark and the surrounding countries tells a different story, however. These countries’ benefits arguably spring from their free-market pasts, not their brief dalliance with big government. …During the early 1900s and following the Great Depression, Scandinavia’s small government and free markets fostered a culture of hard work that paid huge dividends in terms of prosperity. Unfortunately, starting about 50 years ago, Denmark (like many other nations in the region) adopted an expensive welfare state. With bad results. 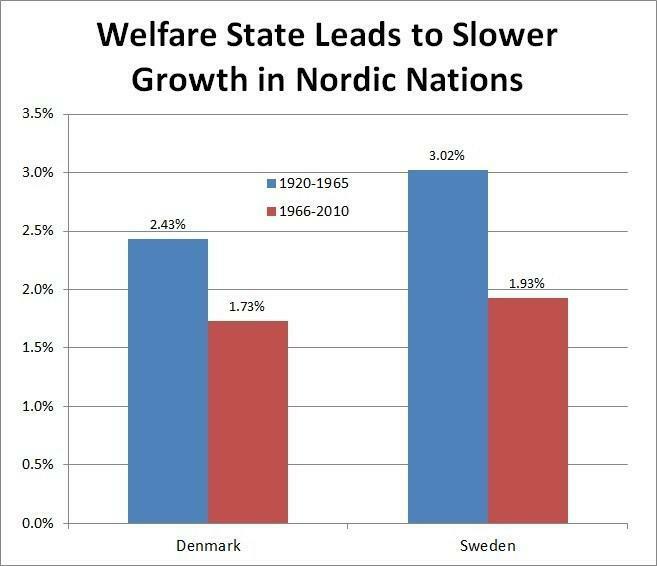 …the 1960s – 1990s expansion of welfare states actually held the Nordic countries back. After their experiment with socialistic welfare states, “Nordic citizens now have unusually high levels of sickness absence (despite being healthy societies), high youth unemployment and a poor record for integrating migrants into the labour force,” Sanandaji explains. Big government has weakened the strong culture which enabled welfare states in the first place… In 2013, roughly 240,000 people — nine percent of the potential work force — were receiving disability checks, and about 33,500 of them were under 40. I fully agree. Denmark’s welfare state has created a problem. Simply stated, there are too many people who depend on government compared to the number of taxpayers who finance government. I sometimes use the example of how many people are pulling the wagon compared to the number of people riding in the wagon. 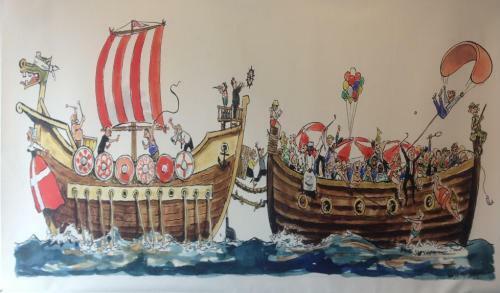 The Danish version uses Viking ships. Fortunately, now there’s an effort to move back in the right direction. Denmark now outranks even the United States as a good place to do business. …In 2013, it reduced early-retirement plans, and cut the term for unemployment benefits from four years to two. …In recent years, all the Nordic countries have decreased their corporate tax rates — each one is lower than in the United States. They also support free trade, unlike American Socialists. Let’s look at some specific examples of how Denmark is trying to undo the damage of excessive government. Bloomberg reported last year about the ongoing effort to reduce the nation’s fiscal burden. When a European government raises the pension age and makes cuts to welfare programs, it’s usually because of dire finances. In Denmark’s case, it’s because of ideology. …Driving the new government’s push is a desire to finance a major round of income tax cuts. “We want to promote a society in which it is easier to support yourself and your family before you hand over a large share of your income to fund the costs of society,” the government of Prime Minister Lars Lokke Rasmussen wrote in its manifesto. It’s all part of a Danish drift toward the political right… Reforms introduced by successive governments over the years have already ensured that Denmark’s expensive welfare state is sustainable for years to come, says Torben M. Andersen, a professor of economics at the University of Aarhus and a former government adviser. These include raising the retirement age to 67 years from 65 years by 2025. Denmark is also cutting back on college subsidies. As one of a handful of countries that offers free tuition to college students, Denmark grants students enormous freedom… But some Danes, especially older citizens already in the labor force, say the extra freedom can eliminate a crucial sense of urgency for 20-somethings to become adults. The country now deals with “eternity students” — people who stick around at college for six years or more without any plans of graduating, solely because they don’t have any financial incentive to leave. …The country has made some headway to counter eternity students. In 2015, the Danish government proposed and passed an amendment to the Study Progress Reform… Jakobsen said the amendment has definitely reduced the trend of eternity students. Now let’s get to my contribution to this discussion. A few years ago, I created a “statism spectrum” to show how countries differ when looking at total economic freedom (fiscal policy, trade policy, regulatory policy, monetary policy, and quality of governance). And I pointed out that nations with onerous fiscal burdens can still rank relatively high if they have a very pro-market approach in other areas. But I have to confess that my spectrum was a back-of-the-envelope exercise. I simply drew a line and then added six countries. Time for some rigor. I downloaded the latest scores from the Fraser Institute’s Economic Freedom of the World and created this chart showing the relative ranking of all the countries (divided by category). As you can see, the United States and Denmark are both in the top category and they both have very similar levels of overall economic liberty. And to put those numbers in context, here’s the same chart, but also showing France, Greece, and Venezuela. In other words, there’s a lot to admire about Denmark. Yes, taxes are onerousand the burden of spending is still too high, but it’s nonetheless one of the most market-oriented countries in the world because of laissez-faire policies in other areas. My bottom line is that Paul Krugman is right to praise Denmark. My only gripe is that he likes the one thing that they’re doing wrong and overlooks all the things that make the country a relative success. Moreover, he ignores all the recent efforts to reduce the fiscal burden of government, probably because that would require him to acknowledge that large public sectors are bad for growth. P.S. Denmark is way ahead of the United States in its market-friendly, savings-based approach to retirement. P.P.S. Denmark also ranks above America in protecting the right of private property. P.P.P.S. But the United States does rank above Denmark when all policies are part of the equation, which presumably helps to explain why Americans are richer. And that also is probably why Danes in America earn a lot more than Danes in Denmark.